6.8 Earthquake hits the Molucca Sea. No tsunami is expected from this earthquake – NWS Pacific Warning Centre. 5.2 Earthquake hits the Carlsberg ridge. 5.1 Earthquake hits the Kuril Islands. 5.1 Earthquake hits the northern east Pacific rise. 5.1 Earthquake hits New Ireland, Papua New Guinea. Three further 5.0 Earthquakes hit the Molucca Sea. Brazil – A heavy rain storm flooded large parts of Sao Paulo Tuesday just as evening commuters were leaving work causing travel headaches and traffic jams several miles long. 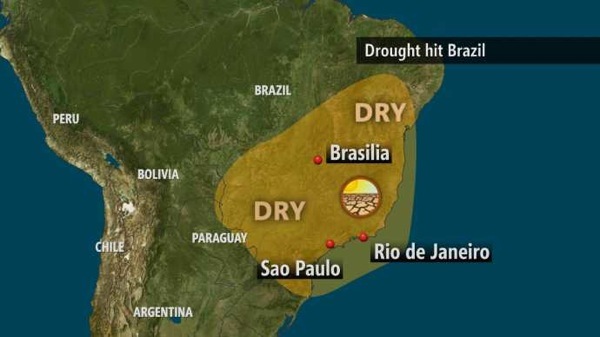 The city of Sao Paulo and the surrounding region is in the midst of the worst drought it has have faced in 80 years. Government agencies said the rain brought some relief, but despite the problems it was causing, it would not be enough to impact stressed reservoirs that collectively sit at about 16% of capacity. The wet season in this part of Brazil usually occurs between November and January and the forecast is for more rain in the coming days. However, the national weather service has said it will not be enough to replenish the areas reservoirs and reverse the drought. China’s Jiangsu Province has reported a foot-and-mouth disease outbreak. Animals showing signs of the disease were first found on a farm in Dongtai township on Nov. 18. It was confirmed Tuesday by the National Foot-and-Mouth Disease Reference Laboratory that the animals had the O-type strain of the disease. After authorities were alerted to the outbreak, the affected zone was sealed off and the affected pigs were culled and incinerated. The ministry said that at the current time, the outbreak was under control. 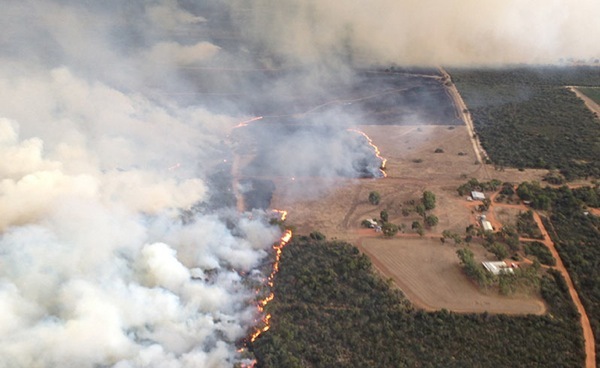 Lives and homes were in danger from three out of control lightning-sparked bushfires burning in Western Australia. An emergency warning had been issued for people in the Shire of Gingin and town of Eneabba. The fires have since been brought under control with the aid of rain from the same thunderstorms that caused them. A house and shed were damaged in the fires.